Caught in a time warp and cocooned in the comfort of French architect Le-Corbusier’s five-decade old designs, the Chandigarh Administration has not agreed to any changes in frontal face of shops in city and would also not permit changes in number of floors or allow basements in existing showrooms. Sources told The Tribune that long-pending proposals to bring in changes in commercial areas after the amendment in bylaws had been put in cold storage. 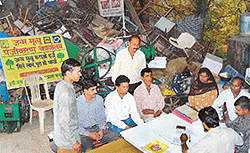 The birth and death registration office, housed in an old cement godown of Haryana Urban Development Authority complex in Sector 6 here, is perhaps the most antagonistic public dealing office. Sardines in a can or kids in a van? 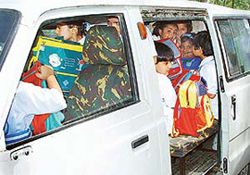 Fifteen students packed in a Maruti van — this is not an advertisement gimmick aimed at creating illusion of space. But a real happening. Guess how many students are there in this van? In a classic case of overloading, 15 students have been stuffed in the vehicle. The police is groping in the dark over the motive and identity of the assailants in last night’s murder of a teenager, Randeep Singh, in Sector 38 here. His companion Harjinder Singh had also sustained injuries in the attack. The Punjab Government has decided to develop the historical Gharuan village the Kharar block as an ‘Adarsh village' under the integrated development scheme and Rs one crore would be spent for providing the basic necessities in the village. The Municipal Council cleared the proposal to privatise the work of sanitation and give the contract to one party despite Opposition councillors opposing such a move at a meeting held today. A long-standing demand of residents of Sectors 41 and 42 was fulfilled today as the UT Administrator, Lieut-Gen J.F.R. Jacob (retd), today inaugurated a vital link between the two sectors benefiting the people living in southern sectors. As a result of the effective steps taken by the Haryana State Pollution Control Board, the number of pollution control measures installed by the polluting industrial units has increased from 1,780 to 4,670 in three years. Never before were children of the city so susceptible to crime. The graph of juvenile crime in Chandigarh has been on an upswing for some time now. Do not believe reports suggesting that India’s national bird, peacock, may soon be an endangered species. More so when you encounter zealous bird lovers like an Indian Air Force personnel who carried an injured peacock on his two-wheeler for more than 10 km in search of quick medical aid last night. Saving the life of the national bird was like performing a national duty for this unassuming person after he noticed the injured bird lying unconscious in the local Air Force Station area late last night. 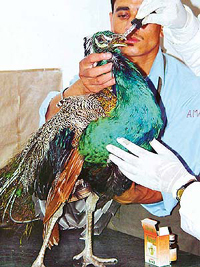 An injured peacock gets treatment at the People for Animals (PFA) clinic in Sector 11, Chandigarh. Some bank branches in the town have been found to have no security arrangements while in certain public sector banks guards are being made to do the work of peons. 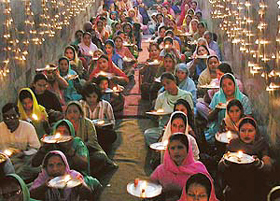 Devotees offering aarti before Durga during Navratra day at Vaishno Mata Mandir, Phase-3B1, Mohali, on Wednesday. Photo Pawan Sharma. To check the sale of adulterated food items and ensure strict compliance with the provisions of the Prevention of Food Adulteration (PFA) Act the UT Food Health authorities today conducted raids on some of the manufacturing units. The Mayor of Chandigarh Municipal Corporation, Mr Subash Chawla, has urged people to live a simple life without hankering after material pursuits. The cremation ground of Sector 25 here is likely to get a facelift, thanks to the decision of the Chandigarh Municipal Corporation. Mayor Subhash Chawla on Monday visited the cremation ground. In the wake of the recent spurt in incidents of chain and purse snatching and vehicle thefts, the Chandigarh police put up surprise check-up points on the main roundabouts and busy city markets here this evening. You name it and they have it. Especially of our ‘desi’ Punjabi variety. Spread over their five shops in Mohali (Phases 3B2, II and V) and one in Chandigarh (Sector 35). Going through the ‘‘Readers write’’ column published in Chandigarh Tribune on April 8, 2003, it came as a shock as to how the process of law is abused by tenants so as to circumvent the ejectment proceedings pending against them by fraud and with mala fide intention. A gang of miscreants looted an Ambala-based timber merchant after drugging him on the busy Chandigarh-Ambala highway last evening. Burglars broke into four shops in the Atawa market, Sector 42, by breaking locks on the shutters and decamped with Rs 2,400 and other goods here in the wee hours today. The City Beautiful has turned out to be the first destination after Bangalore for the launch of Madura Garments’ latest offering, SF Jeans. The National Institute of Personnel Management (NIPM) on Monday organised a workshop on “Business communication for role excellence” at Hotel Piccadily here. Mr Sanjay Kumar, Labour Commissioner, Punjab, was the chief guest. The visitor to the eateries or hotels of the city or that of tourist places in Himachal finds his culinary taste enhanced with the aesthetics and comfort added to eating by the crockery and utensils supplied from Sector 18-C market. With the University Grants Commission (UGC) extending the status of Panjab University’s Department of Physics as a Centre for Advanced Studies for another five years, the department is expected to undertake a major programme to add new equipment to its laboratories and upgrade the existing facilities. 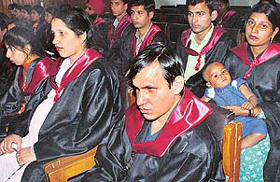 As many as 166 students of the Government College of Education, Sector 20, received degrees at the annual convocation organised here today. The Adviser to the UT Administrator, Mr Virendra Singh, was the chief guest on the occasion and delivered the convocation address. Panjab University has dispatched the roll numbers of all eligible candidates for the forthcoming annual examinations of the post graduate classes, an official press note said here on Monday. An anticipatory bail application, moved by a former Vice-Chancellor of Panjab University, Prof M.M Puri, regarding the alleged misuse of official telephones for personnel use, was rendered infructuous by UT Additional District and Sessions Judge Sneh Prashar, acting on a police report that no case or any inquiry was pending in the Sector-11 police station against Professor Puri. 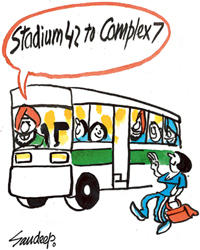 In a petition filed before the Punjab and Haryana High Court, a Naya Gaon resident Dr B. Singh today sought directions to the Chandigarh Administration and other respondents to ensure “slum-free” urbanisation. 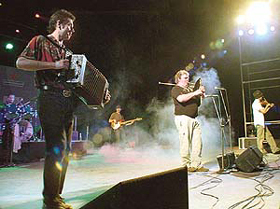 It was a day of divine melodies at Leisure Valley in Sector 10, where the visitors had gathered to treat themselves to the ethno-rock concert presented by a seven-member rock troupe from France. 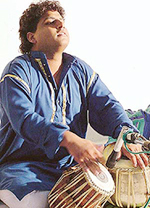 Punjab Sangeet Natak Akademi today started its series of music programmes with a tabla recital by Amit Sachdeva. Known for his exquisite handling of the instrument, Amit commenced his recital with vilambit teen taal in which he displayed the various technical points that make tabla recital dear to the audiences. A high-powered committee, comprising officials from the Administration, Health, Municipal Corporation and Public Health met yesterday to review the arrangements to check outbreak of water-borne and vector-borne disease. Amidst fears of severe acute respiratory syndrome (SARS) gripping the world and its causes remaining unknown, Daddu Majra and Sector-38 West of the city have come under a sudden assault from disease-spreading flies. Regarding the news item “Delayed power connection costs PGI Rs 22 lakh” in Chandigarh Tribune on April 3 the head of the Radiodiagnosis Department at the PGI, Prof Sudha Suri, commending on the audit report, has sent the following clarification. Jaundice, at the tender age of four left him deaf. After struggling with conventional hearing-aids for 18 long years, Gurpreet Singh cannot conceal his excitement as he became the first patient at the PGI to undergo cochlear implant surgery, yesterday. 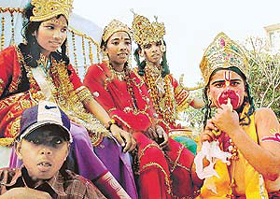 The city has abundant facilities for various sports disciplines but they are scattered in different sectors. Due to this, sportspersons, especially children, find it difficult to reach the sports centres. Stadium XI trounced Satluj Public School, Panchkula, by 10 wickets in the first SN Vohra Memorial Cricket tournament in the under-12 section. The Municipal Corporation of Chandigarh (MCC) has demanded a Rs 23-crore first quarterly instalment of grant from the Chandigarh Administration. Minutes after inaugurating the new office of the SDM (south) in the Sports Complex, Sector 42, the UT Administrator, Lieut-Gen J.F.R. Jacob (retd), today asked his Adviser, Mr Virendra Singh, to immediately look for a new site and start construction of a new office for the SDM and shift it out of the sports complex where it had been opened today.